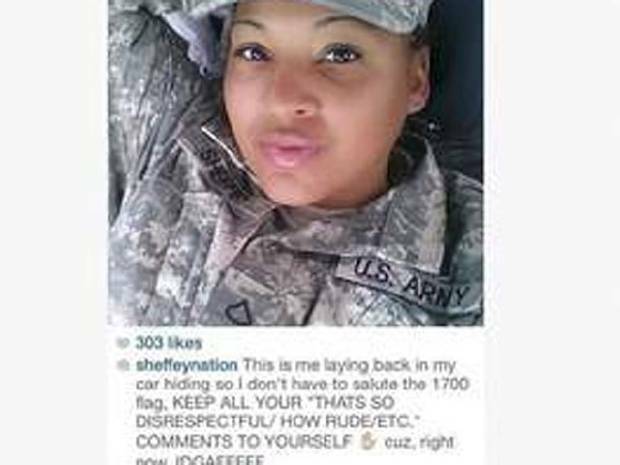 Recently a Ft Carson soldier posted a selfie on her instagram account proclaiming she was avoiding the flag salute. Her action has captured the attention of the entire country this week and I think illustrates my point made in an earlier blog regarding today’s youth. Her selfish narcissist behavior is on full display for the entire world to see. I wonder how she feels now. Does she still not give a bleep like her post suggested or is she ashamed? What I fear is by not saluting her blatant disrespect to all who died fighting for their country that that flag represents allows her to be recognized as some sort of celebrity now. Are we going to see her side by side with Cindy Sheehan, the mother whose son was killed in Iraq while serving in the military, who later became a vocal mouthpiece for anti-military and leftist propaganda? The US military has a proud tradition and part of that tradition involves saluting the American flag at various times during the day. It is a duty that any patriotic person with honor would gladly recognize and perform. There was a time when I would have given anything to be able to stay in uniform but alas due to health reasons I could not. This soldier’s attitude I find disgusting. Perhaps Pfc. Tariqka Sheffey needs to be removed from the military and soon. Her type of attitude is poison to morale and in an all-volunteer force it is not needed nor wanted. For those of you who have served this country in combat, would you want this person next to you in a foxhole, I sure as hell would not. Nor would I want her really anywhere near me. There will be some that say she has a right to disrespect the flag and that might be so if she were a civilian but not while wearing the uniform. Selfless sacrifice, commitment to duty and service with honor are what I believe our country expects from its service members. There is no place for “selfies” in our military and society could use less of them too. By JJPaladin in Politics/Government/Law on February 26, 2014 .